Augmented reality game Pokémon Go saw explosive growth in the weeks following its release. People swarmed onto the streets in search of their next catch, visiting Pokéstops in obscure locations to obtain items and battling others at Pokégyms. At its height in July, Pokémon Go had 45 million active users. However, a few months later and this number has decreased to 30 million. In such a short amount of time, it's difficult to understand how 15 million people could have chosen to abandon ship. For those of us who grew up during the early days of Pokémon, the dream to become a Pokémon Master and catch 'em all was widespread. Many of us spent our elementary school recesses playing with Pokémon cards, always in search of those special shiny cards. When the news arrived that we finally had our chance to do just that, worldwide hype snowballed into a collective frenzy. Before the app was even released in some areas of the world, people had found a way to download it and begin catching Pokémon. In the beginning, many of us thought Pokémon was here to stay. 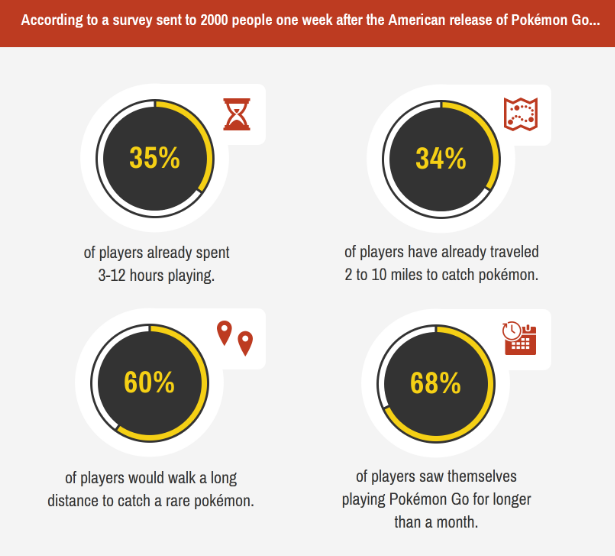 In fact, when surveyed, 68% of players anticipated continuing the game for more than a month. This initial excitement solicited a Pokémon bandwagon on which even people who don't do any regular gaming downloaded the app to see what it was all about. At first, I found myself out late at night excitedly searching for Pokémon. As time has progressed and my ability to catch anything other than seemingly innumerable Drowzees continued, I have simply lost interest. Playing Pokémon Go can begin to get a bit tedious when you encounter the same old Rattata or Weedle over and over again. Obviously, as you level up you begin to see different Pokémon and even rarer ones. However, it takes a significant amount of time to arrive at level 15 or higher. Even when you do get to level 15, you are still greeted by easy-to-catch Pokémon and using your Pokémon balls on them can seem like a waste. The rarest Pokémon of all may not even be on your continent. Users who have managed to catch them all have had to travel overseas to find the most elusive Pokémon. With this in mind and the abundance of lower grade Pokémon, it can be difficult to motivate one's self to search for the seemingly unfindable. For those living in the global North, Pokémon Go was released in the middle of summer, a time in which hunting for Pokémon is more accessible as the weather permitted one to search day or night. As winter gets closer and closer, the opportunities to find your next catch become limited. In the summertime, people gathered excitedly en masse in public spaces to catch Pokémon together. As the days grow shorter and the weather colder, there is less of a likelihood that people will attend Pokémon meetups or continue scouring the streets at all hours of the day. 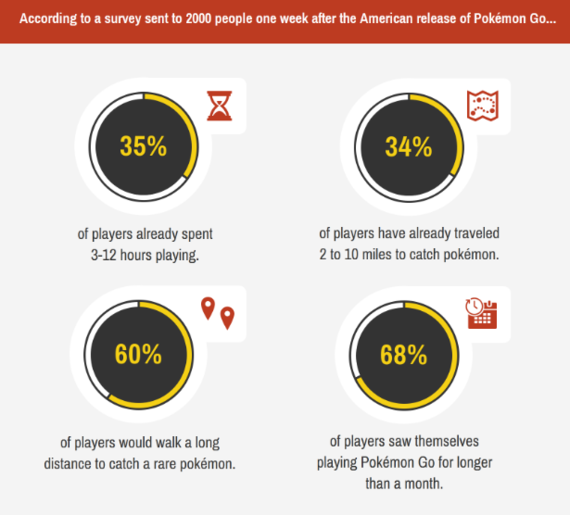 Despite the significant decrease in active users, Pokémon Go still retains a large following. With so many people using the app, the servers for Pokémon Go have been constantly in flux and subject to technical difficulties. There have been many times when I have opened the app only to see a message describing that the server was overloaded and I would have to wait. This has been frustrating as I have only been able to play at certain times and to consistently open up the app and see this message has proven anti-climatic. Throughout playing Pokémon Go, it has been difficult to identify whether or not the tracking system has actually worked. My tracker has always seemed to show rarer Pokémon lurking in the vicinity but they never show up. Instead, I have been greeted by a plethora of Zubats. Intuitively, the tracking system seemed to say that if I walked further, I would find more diverse Pokémon. As this never seemed to be the case, I simply ignored the tracking system altogether. On several occasions, I have found a rare Pokémon only to run out of Pokéballs. Not wanting to let it get away, I have quickly attempted to buy Pokéballs before the Pokémon disappeared forever. It isn't always possible to visit Pokéstop after Pokéstop to stock up on Pokéballs. Therefore, purchasing Pokéballs can often be a lot more accessible. However, having to continuously pay to stock up is a bit of a buzzkill. Not everyone is able to afford the in-app game purchases of Pokémon Go and it's frustrating to know that someone who can can essentially game the system by stocking up on essential items. At some point, you begin to feel that if you cannot afford to keep paying, you may need to simply take a break from Pokémon Go. There has been significant media coverage of people getting finding themselves in precarious situations due to Pokémon Go distracting them from their surroundings. People have been caught playing the game while driving. Distracted driving can result in bodily injury or death of not only the person playing but also passengers in their vehicle, other road users and pedestrians. In general, it is important when you are driving or doing another activity to focus on whatever you are doing to avoid being injured. When a game becomes too addicting, people may sacrifice their safety in exchange for catching a nearby Pokémon. The crackdown on distracted driving is a contributing factor to the decline of the game's popularity. With these six reasons in mind, it is easier to understand why the total amount of active users on Pokémon Go continue to decline. People may stop playing as much or altogether due to one or several of the reasons described above. Whatever your reasons, it is undeniable that the initial hype and warm weather of July are no longer here to keep us outside hunting for a rare catch.